How to launch a WordPress site in seconds? 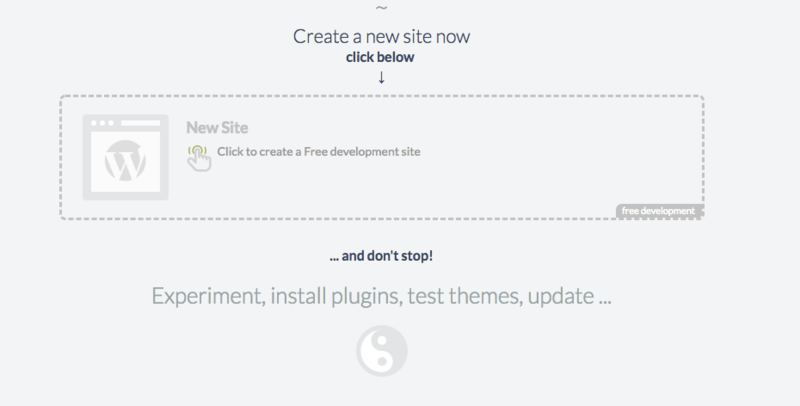 Goal: Learn how you can launch a WordPress site in 20 seconds in wetopi. At Wetopi, all WordPress projects by organized by sites. 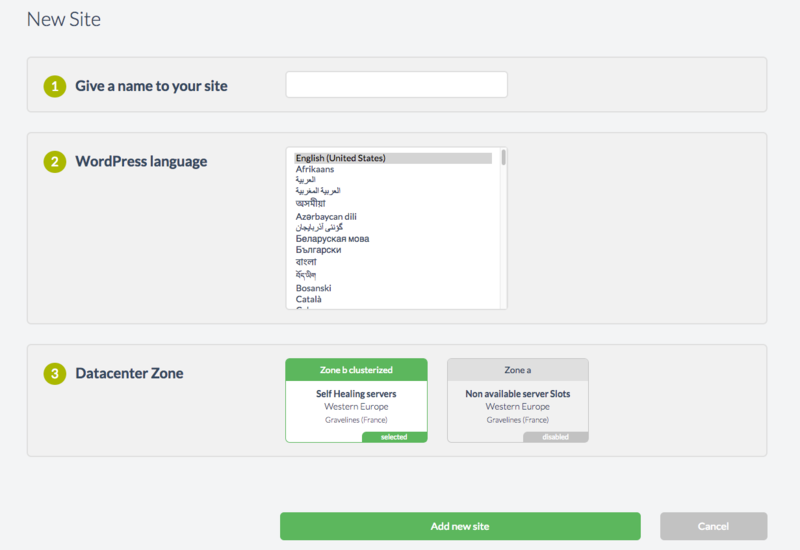 To launch a WordPress site, the first thing you have to do is to add a site to your account. Each site has a minimum of 3 framed boxes. The first box is “Demo”, your newly minted WordPress site , and the remaining 2 with grey dashed lines are labeled as “Spare server”. This boxes are called clones. 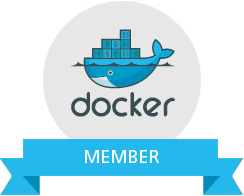 A clone is dedicated finely tuned container-server which has the same resources as the Primary server. 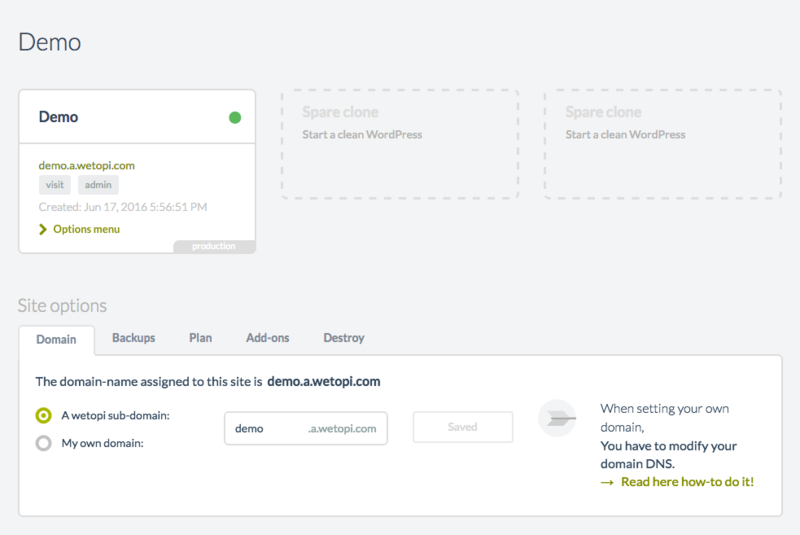 You can create a clone to run a duplicate copy of your WordPress site for testing and debugging or to launch another WordPress site. You have now successfully launched your first WordPress site, Assign a domain name to it and start development immediately. By clicking the button “visit”, we’ll jump to our new WordPress site. Thanks to SSO “Single Sign On”, you can recycle the secure wetopi session. This is a good thing. Not just because with a simple click we can jump straight to our WordPress admin, but because we are not exposing our WordPress credentials across the network. This is something to take in consideration, specially nowadays we work remote and connect to Unsecured Wifi Hotspots. 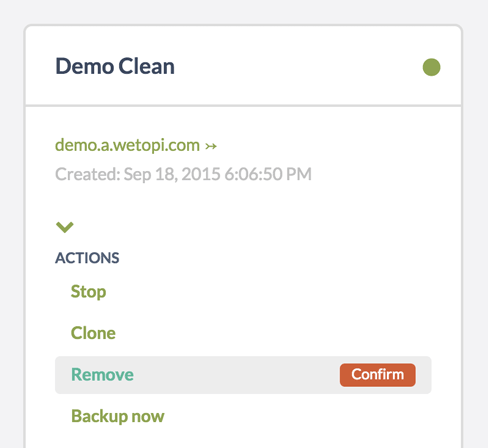 Wetopi is a pay-per-use platform, so after playing with your demo, you can save credit by stopping or destroying your server. You just have to click the “Delete” and confirm. The “Backup now” button will allow you to keep a backup and the ability to restore your server later without wasting server resources.